It might surprise modern readers to learn that, as American troops fought their way across Europe during the closing years of World War II, the most beloved fellow soldier to tour the front lines was a glamorous German-born entertainer by the name of Marlene Dietrich. A wisp of a woman with a smoky voice which overtly oozed sexuality, Dietrich is best remembered today for her electrifying performances in such films as The Blue Angel, Morocco, Shanghai Express and Destry Rides Again. Yet even as her star was rising, ominous clouds overshadowed her homeland, causing the willful Dietrich to openly renounce Adolf Hitler. 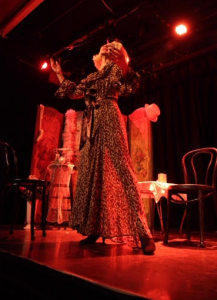 How Dietrich rose to fame in Hollywood, only to put her career on hold as she endeavored to free Germany from the iron fist of Fascism, is the subject of an engrossing one-woman play, simply titled Dietrich. Written by LA-based playwright Willard Manus, directed by Judith Rose, and starring Cindy Marinangel (with off-stage accompaniment by pianist Russell Daisey), Dietrich is based on a true story. Set in May 1960, the play takes place when Marlene Dietrich returned to the Berlin stage for the first time since fleeing the Hitler regime in the 1930’s. Inside her dressing room at the Tatiana Palast Theater, Dietrich weighs whether to go through with the live performance, despite threats on her life by Nazi sympathizers who still resent her for having spent much of World War II entertaining American soldiers. To them, Dietrich is a turncoat; a traitor who deserves to be shot and killed on stage. Dietrich (formerly known as Marlene) had its World Premiere at the Brickhouse Theatre in Los Angeles and debuted last year in New York at the Hudson Guild Theatre, as part of the New York Theatre Festival’s Winterfest. Since then, the show has popped up several times around New York – most recently playing to capacity crowds at the Traid Theatre. Riding a wave of excellent reviews (this critic most certainly enjoyed it as well), Marinangel is currently fielding inquiries about taking Dietrich on tour. To learn more about the show – and the creative team behind it – we spoke with playwright Willard Manus. LAPX: Thank you for taking some time to speak with us today. We had the privilege of seeing your play Dietrich in New York a few weeks ago. How did you come to write it? Playwright and author Willard Manus. Manus: The genesis of that show probably goes back 25 years here in Beverly Hills, where I live. A Croatian actress moved next door and she looked remarkably like Marlene Dietrich, at a young age. And she could sing, so I put together a cabaret show – not too serious on the drama – but to give her a chance to sing some Marlene Dietrich songs. The show didn’t work out in the end, so I put that script on the shelf. When I met Cindy (Marinangel) about 7 years ago, she appeared in a play of mine called Berlin Cowboys. She played a German madame, so we had her sing a Dietrich song. We decided that would help the script. She did such a good job, and I realized she was such a terrific performer, I pulled out that old Marlene Dietrich script and started working on it again. I did more research and approached the story in a more comprehensive way, and came up with the show she is now doing. It’s funny – I had initially thought of Cindy for a Mae West story I was working on, but the Dietrich script pushed its way to the forefront. We did a workshop production of Dietrich here in LA, but Cindy was moving to New York, so she took the show with her. She’s had a few very well received short-run productions there, and that’s how you were able to see it. LAPX: Were you interested in Dietrich before meeting the Croatian actress or did the stars just align when she moved next door? Manus: I’d always been fascinated by Dietrich, at least from what I knew of her at the time. Of course, the big book by her daughter hadn’t come out by that point. There were a lot of intimate things her daughter revealed that I didn’t know about. Dietrich was a dynamic, irrepressible figure with that charm and sexuality, which was always intriguing. In the back of my mind, she was just a character I was always interested in but never got serious about til I met that actress from Croatia. When I showed Cindy the script, she was immediately interested in it, but I realized I had to go much, much deeper into Dietrich’s character to come up with a workable show. That re-worked script is the script Cindy started working on here with a director named Judith Rose. Judith is a fellow of mine with the Actors Studio Playwrights unit. The result was basically what you saw in New York, though Cindy has added a pianist and more music. Knowing that Cindy can handle the Dietrich songs, I gave her my blessing for adding the additional music. LAPX: Have you seen any video of what Cindy is doing with the show in New York? Manus: I have not seen what she has done with the show in its entirety, but if we get an extended run in New York or elsewhere, I’d certainly be there to help in any capacity that I could. LAPX: Did reading the daughter’s book factor into your rewrite of the script? Manus: Yes, I used that and some other sources. Of course, there will always be new books written about Dietrich. She’s an iconic figure and writers love to look at her from different angles. There are 4-5 major books about her in English and who knows how many more in German or other languages. LAPX: Switching gears a bit, Cindy mentioned that you also have a play about Frank Sinatra and Ava Gardner. Manus: That’s right. It premiered here about 4 years ago. The interesting things about it is that the guy who played Sinatra – Rico Simonini – is not only a fine actor, but he’s one of the leading cardiologists in Los Angeles. He’s stationed at Cedars – Sinai Hospital. He was also in that play I mentioned earlier – Berlin Cowboys – with Cindy, so I’ve known him for a number of years. I had Rico in mind when I wrote the Frank & Ava play because I knew he could play it. He’s Italian and somewhat resembles Sinatra. LAPX: May I ask who played Ava Gardner in the stage production? Manus: Stefany Northcutt – another fine actor – played Ava Gardner. LAPX: How did Frank & Ava end up on film? Manus: Rico became so involved with that project that he decided it should become a movie. He pushed the project for over three years; raised the money to make it; and now we are trying to cut a deal for distribution of the film. I know it could be sold to one of these outfits that does video streaming, but we’d like something more for the film, so not yet. I don’t only write about celebrities, by the way, but I do have a third play about Joe DiMaggio and Marilyn Monroe. Rico played DiMaggio in that one with Emily Law playing Monroe. That was quite successful here. By the way, Emily plays the part of Gardner in the film. The unique thing about the Los Angeles theatre scene is it’s all about compromise. You may have someone in mind for a part, then they get a role on a television show or five days work in a film, so you move on to another actor. But they are all professional people out here and they usually do a hell of a job. LAPX: As a playwright, how would you compare LA to the New York theatre scene? Manus: Los Angeles theatre was always perceived to be a poor second cousin to New York, because the movie world and television predominated the news out here. Sadly, with the demise of print journalism, things have only gotten worse, because there is a lot of theatrical talent out here. The LA Times used to have 4-5 writers who would cover just about every theatre production here in town. Now they only have one full time critic and a few part-timers, and they almost never cover a small theatre production. You’re lucky if they even come to see your show. LAPX: How many years have you been in the Los Angeles area? Manus: Well, I’m originally from New York, but to quickly give you my history, my wife is Scottish and she was working in the late 50s for a theatrical company which was based in London. She was recruited by the Theatre Guild to come work for them in New York. She managed the Westport Country Playhouse and another playhouse in Fishkill, New York. I had to go to Europe to meet my in-laws, but before we left, a Greek-American painter by the name of Peter Panos said, ‘Hey, Manus – you’re a writer – you’ve got to go to Greece. If not, you’ll be sorry.’ So, we followed his advice and went to Greece. We ended up on the Island of Rhodes in a village called Lindos. We were on our honeymoon and we thought we would stay there for three days, but we ended up staying there for thirty years. We just fell in love with it and had a whole other life in Greece. I wrote a book about our experience called This Way To Paradise – Dancing On The Tables. We came back to the states in 1980, settled in Beverly Hills, and have been here ever since then. LAPX: May we ask what you did while you lived in Greece? I have done journalism since I left college and that’s what I did to survive. I wrote travel articles and eventually worked my way up to being the Mediterranean Correspondent for the Financial Post. That’s a Canadian paper sort of like the Wall Street Journal. So I covered Greece and Turkey, Lebanon, Italy – places like that. This was before everything really blew up in Lebanon. I wasn’t writing politics – I was a travel writer – so I could only look at that situation obliquely. LAPX: Aside from the plays you’ve already mentioned, what else have you been up to since your return? Manus: Well, I wrote a number of screenplays which were optioned but never produced, which is a very frustrating experience. I segued into writing novels for a publisher who had an independent press. He got some stake money which was sufficient enough for me to write three books for him. After he sold his business, I got started writing plays and have probably written 40-50 plays. Not all of them have been produced, by I’d say maybe half have. LAPX: Are your plays genre-driven, or do you tackle a wide range of subjects? Oh, they’re all over the map, but I realized over the last ten years there is a market for plays about celebrities. I’ve written the plays I mentioned, plus two other plays about Monroe. I’ve also written two jazz plays – one of which will be done this Saturday night called Prez! about a famous jazz man named Lester Young. If you’ve ever heard Billie Holliday, he’s usually the guy playing tenor sax behind her. There’s a solo play about Charlie Parker, called Bird Lives! The actor in that play – Leslie Jones – is not only a good actor, but he is a professional musician. I wrote the Charlie Parker play for him because he could play some of Bird’s music live on stage. My big full length play is about my family. Both my mother and her sister went deaf in their early twenties, and there was a big family conflict over what course to take. One wing of the family wanted everyone to learn sign language. The other wing thought people looked down on the deaf and dumb, so it would be better for the girls to learn lip reading and try to hide the fact that they’d gone deaf. That was called, Just a Song at Twilight. I’ve also written a play about a Greek-American family based on a true story, and I mentioned Berlin Cowboys, which deals with the CIA in Berlin before the wall was torn down. LAPX: Please tell us more about that. Manus: The CIA dug a tunnel under the Berlin wall so that they could tap into telephone and telex messages that the East Germans were sending to Moscow. Along with some comic plays and some sitting on the shelf which have not been produced, that gives you an idea of some of what I’ve done since I came back to the states. Please follow this link for booking inquiries for Dietrich.